Co_Education : Yes , Total Enrollment : 2268, Motto :Historically American. Uniquely Caribbean. Globally Interactive. 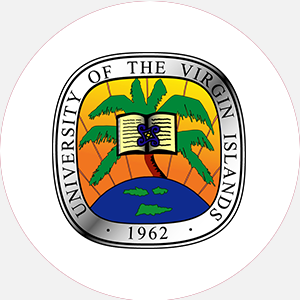 The University of the Virgin Islands (UVI) is a four-year, territory-supported, coed, liberal arts i…. The University of the Virgin Islands (UVI) is a four-year, territory-supported, coed, liberal arts institution that was founded in 1962 as the College of the Virgin Islands to serve residents of the Virgin Islands and the Caribbean. To more accurately reflect the growth in programs, the name was changed to the University of the Virgin Islands in 1980. UVI has a main campus in St. Thomas and a branch campus in St. Croix. The St. Thomas campus occupies 175 acres overlooking the Caribbean Sea, with its own beach, golf course, and tennis courts. The University’s role is the same as state colleges and universities on the mainland of the United States. The University was designated a land-grant college in 1972. The St. Croix campus is located 40 miles from the main campus and came into use in 1964, adding 130 acres, the headquarters of the Virgin Islands Extension Service, and the Virgin Islands Agricultural Experiment Station to UVI. UVI is a territory-supported land-grant institution that offers programs of instruction, research, and public service that address the needs of the individual and the region. The University is committed to the advancement of scholarship, excellence, and innovation as it strives to provide intellectual and educational leadership. The University of the Virgin Islands is accredited by the Middle States Association of Colleges and Secondary Schools to award the Associate of Arts, Associate of Science, Bachelor of Arts, Bachelor of Science, and Master’s degrees. Financial Aid Specific to the School Tuition waivers are available for senior citizens 60 years of age or older who have been residents of the Virgin Islands for at least one year. For applicants from the Virgin Islands, United States, and Commonwealth of Puerto Rico, graduation from an accredited high school and completion of the following units: 4 English, 2 mathematics, 2 science, 2 history, 2 physical education, and 1 foreign language recommended; minimum 2.0 GPA; written essay; and completion of U.S. Virgin Islands placement exam. A non-refundable application fee is required. Late applications require an additional fee. A minimum of 62 hours and completion of core requirements for an associate’s degree; 120 semester hours and completion of core requirements for bachelor’s degree, including six mathematics, six science, twelve foreign language, and a computer course for some majors; satisfactory completion of the English proficiency examination. Campus Services: Health, personal counseling, career counseling and placement, and student employment. Campus Activities: Social and cultural activities include theater group. There are over 32 student organizations, including a student government association and national Greek letter sororities and fraternities. Housing Availability: 250 housing spaces (main campus only); off-campus living permitted. Handicapped Services: Grievances may be raised by handicapped students that relate to academic programs and practices.